Today I’m participating in "Waiting On" Wednesday, a weekly event hosted by Jill at Breaking the Spine. Its purpose is to spotlight upcoming book releases that we’re eagerly anticipating. Fantasy novelist Diana Wynne Jones (author of The House of Many Ways, Eight Days of Luke, Enchanted Glass and more) passed away in 2011, but she apparently had one manuscript almost finished. Her sister Ursula Jones has completed it, so all of DWJ's fans will get to experience one more fantastic and whimsical adventure from one of the best. 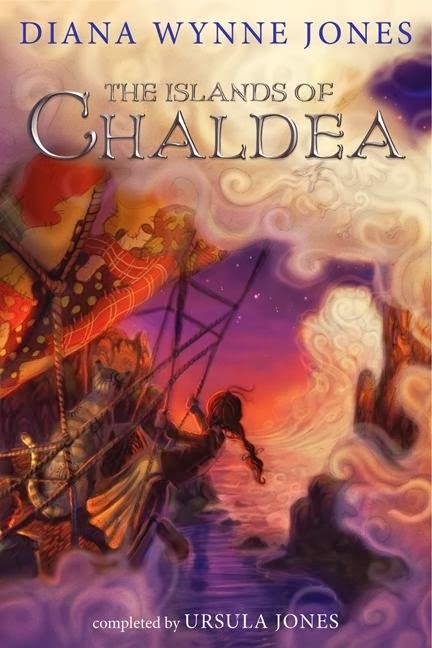 The Islands of Chaldea will be released by Greenwillow Books (HarperCollins) on April 22, 2014. Aileen comes from a long line of magic makers, and her Aunt Beck is the most powerful magician on Skarr. But Aileen's magic has yet to reveal itself, even though she is old enough and it should have, by now. When Aileen is sent over the sea on a mission for the King, she worries that she'll be useless and in the way. A powerful (but mostly invisible) cat changes all of that-and with every obstacle Aileen faces, she becomes stronger and more confident, until her magic blooms. This stand-alone novel, by the beloved and acclaimed author of such classic fantasy novels as Howl's Moving Castle and the Chrestomanci books, will be welcomed by fans old and new. Sounds pretty cool and the cover is awesome. Snap! I'm definitely going to go for the UK one though--prettier cover and earlier release date!! !